Requiring only electricity (generator, grid, solar) to operate successfully, the WGS-900 has a simplified user interface allowing the unit to be operated by users with any level of mechanical know-how. It’s easy to install, easy to use and easy to maintain, and it’s also the most efficient unit of its kind on the market. 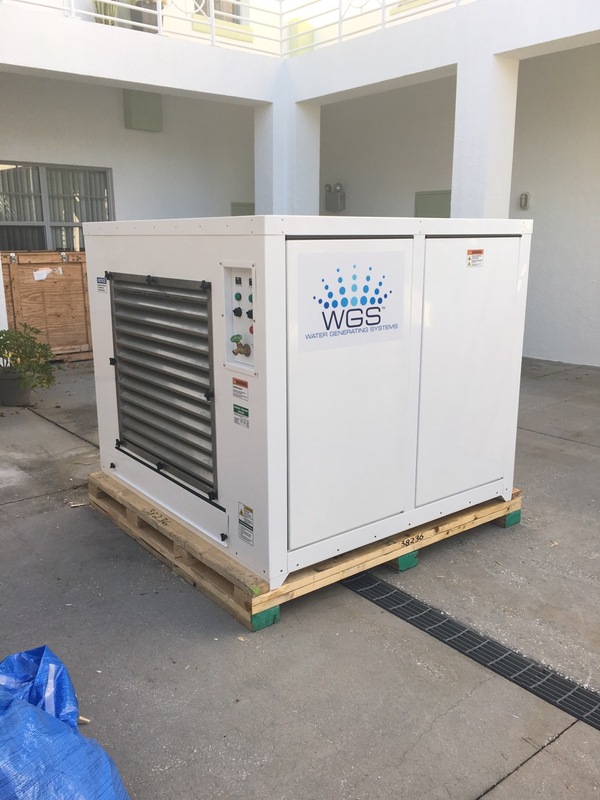 Water Generating System’s commercial unit, the WGS-900, arrived today at our Engineering and Technical Support facility in St. Petersburg, Fla. 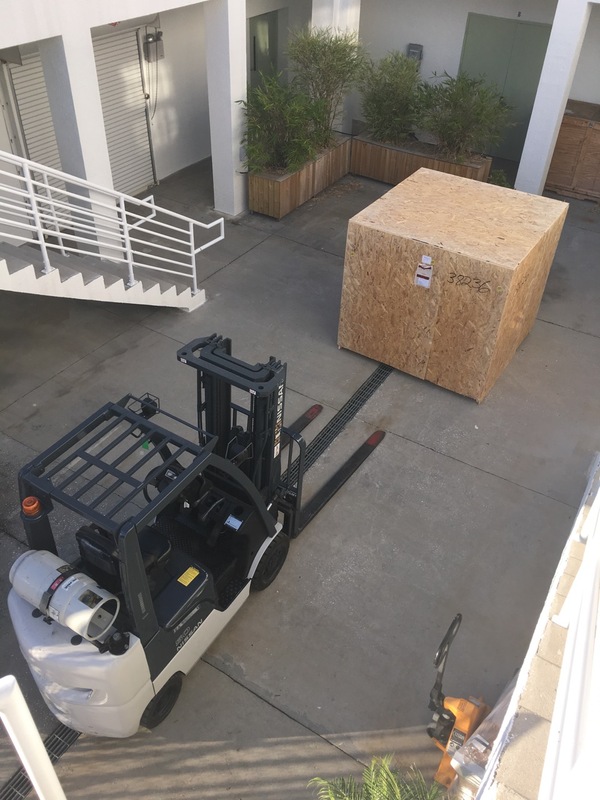 Capable of producing up to 600 gallons of potable water per day, this unit will be installed at the Florida office for demonstrations, maintenance and performance tests, and, of course, water production. Water Generating Systems Vice Chairman George Sawyer, CEO Peter Ottmar and President/COO Keith Authelet recently visited Iron Mountain, Mich. to meet with engineering partner Trident Maritime Systems – an IMECO Division and production partner Systems Control and to review production, recent developments and procedures. Below is a photo of the WGS, Trident Maritime Systems – an IMECO Division and Systems Control teams with the WGS-900 commercial unit. Tony Welch, Paul DeMay, Andy Thom, Carl Seidel, Brad Lebouef, Adam DeGroot, Scott Cameron (Systems Control); Peter Ottmar, Keith Authelet, George Sawyer (WGS); Shawn Hill, Ryan Larson, Dan Formolo, Tom Gibbons (Trident Maritime Systems – a Division of IMECO). Water Generating Systems has authorized product development partner, Trident Maritime Systems – IMECO Division, to commence initial development of the WGS 100 residential units. Trident Maritime Systems will concentrate initial efforts on the development of the Stand Alone AWH Unit. 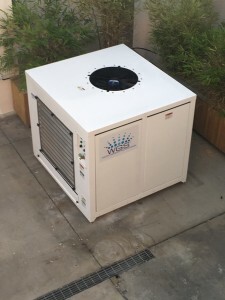 This single, enclosed unit will be situated outside the home with plumbing into the home for potable usage (i.e., drinking water and food preparation usage). It will include a water purification and storage system that can be integrated into the home plumbing system. At ambient air temperature of 80°F and 60% relative humidity, the WGS-100 will generate 50 gallons of pure potable water daily. WGS expects to begin production of the unit later this year. Water Generating Systems LLC (WGS) is an international engineering research and development company focused on the global needs of water sustainability and supporting technologies. WGS was founded on the principle that today’s technology should be able to solve one of the world’s most pressing needs: the availability of potable drinking water. 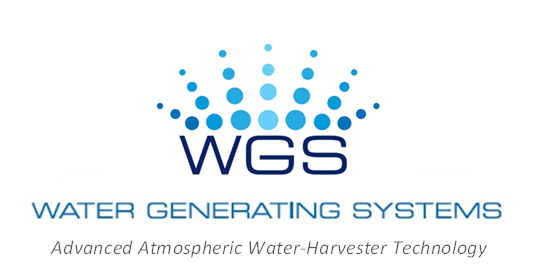 Leveraging patented processes and innovative engineering approaches, WGS has developed a robust line of portable atmospheric water harvesting products. For more information, visit www.watergeneratingsystems.com. WGBH Boston has partnered with the American Academy of Arts & Sciences to produce a web series called ‘Water Pressure: Saving A Threatened Resource’ discussing water and the growing need to re-focus attention on this critical resource. ATTLEBORO – Water Generating Systems LLC has elected three new members to its board of directors. Joining the board are Keith Authelet, president and chief operating officer; Anthony G. Marken, senior vice president of government markets and business development, and Bryan Chance, executive director at Ernst & Young LLP. ATTLEBORO, Mass. – June 10, 2015 – Water Generating Systems LLC (WGS) announced today that it has elected three new members to the Company’s Board of Directors. Joining the Board are Keith Authelet, President/COO at WGS, Anthony G. Marken, Senior Vice President of Government Markets & Business Development at WGS, and Bryan Chance, Executive Director at Ernst & Young LLP. Authelet, who was also named to an executive position by the Board, joined WGS in April 2014. He has extensive entrepreneurial roots, using his global experience to lead several successful small companies in the international market. Previously, he founded and funded Virtual Building Logistics, an internationally recognized industry-leading building information modeling (BIM) firm, and served as Chief Information Officer at Gilbane, where he was recognized by Information Week as a top IT innovator worldwide for four consecutive years. As a global senior executive at Lotus Development/IBM, he was responsible for a number of diverse international businesses. On the development side, he directed the Virus Intrusion, Build Engineering and Cross Platform Tools organizations. On the product delivery and documentation side, he directed the Engineering, Product, and Graphic Services groups. He was also responsible for Acquisition Integration and Business Transformation/IT across WW Services and Support Businesses. Marken, who was also named to an executive position by the Board, joined WGS in February 2015. He previously served as a Principal at Capitol Counsel, representing states, national developers and energy renewable companies. He focused on DOD Base Realignment and Closure Act, military base retention programs, Pentagon-wide privatization efforts and public/private partnerships across many federal agencies. His most recent efforts focused on Port Authorities participating in the harbor dredging programs managed by the U.S. Army Corp of Engineers. Before joining Capitol Counsel, he was Vice President at The Washington Group for five years representing clients focused on the re-development of former military bases, and the privatization of military housing and utilities programs at DOD. Chance, an Executive Director at EY, has 23 years of multi-industry, advisory and transaction experience. He focuses on leading strategic growth with key organizations through organic, transactional and venture growth. He has robust financial and transactional experience in private equity, debt and public markets. Bryan has led organizations across many ecosystems, including: For-profit and not-for-profit acute care and long-term care providers, medical device and pharmaceutical manufacturing organizations, patient direct services, telecom and technology services (commercial and defense related), and energy (hydro-carbons and renewable sources). The markets he has served include North America, Kingdom of Saudi Arabia, United Arab Emirates, Brazil, Argentina, South Korea and China. For complete listing of Board members, please visit http://watergeneratingsystems.com/our-team/. ATTLEBORO – New England cable TV pioneer Peter Ottmar is hoping to capitalize on yet another technology by literally wringing water out of the air to supply a thirsty world. Ottmar, CEO of Water Generating Systems, recently completed a $21 million fundraising round and plans to open an Attleboro marketing office for the research and development company. 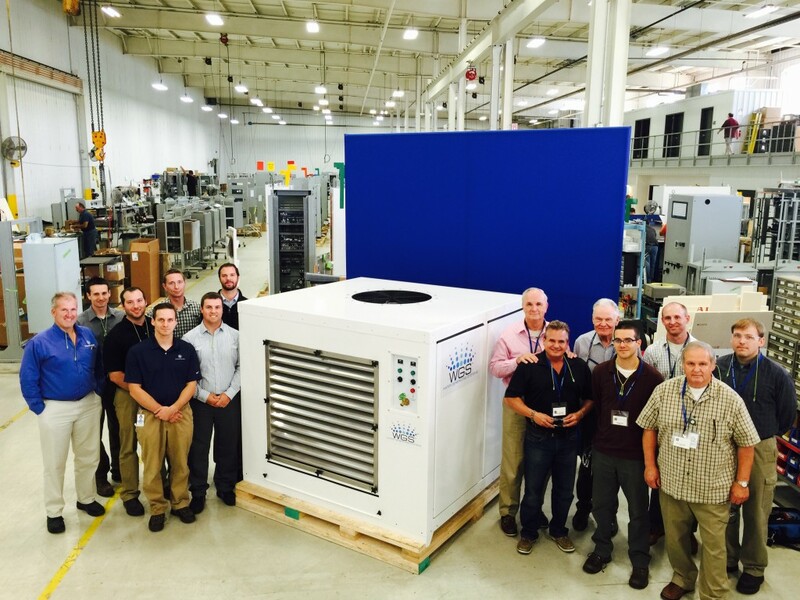 ATTLEBORO, MA – April 30, 2015 – Water Generating Systems LLC (WGS), an international research and development and marketing firm, announced today its first closing of Series B Financing, bringing the total amount raised to $21.45 million. This amount includes private investments and government contracts raised by its predecessor company, Marine Desalination Systems. WGS has established a two-year partnership with Trident Maritime Systems, an electrical and mechanical systems design, engineering and integration company based in Iron Mountain, Mich.
“As water becomes increasingly scarce in many areas of the world, IMECO is proud to be part of the Water Generating Systems team designing effective and affordable solutions to those living and working in these water-distressed regions of the world,” said Gary Schettler, President of Trident Maritime Systems, IMECO Division. Water Generating Systems LLC (WGS) is an international product research and development and marketing company focused on the global needs of water sustainability and supporting technologies. WGS was founded on the principle that today’s technology should be able to solve one of the world’s most pressing needs: the availability of potable drinking water. Leveraging patented processes and innovative engineering approaches, WGS has developed a robust line of portable atmospheric water harvesting products. For more information, visit www.watergeneratingsystems.com. Trident Maritime Systems – IMECO Division is an electrical, mechanical and power systems design, engineering and integration company serving the naval shipbuilding, commercial shipbuilding, and offshore markets. The company’s offerings include HVAC and Refrigeration Systems, Fire Suppression Systems, Cargo Handling Systems, Underway Replenishment Systems, Electric Steering Systems, Electric Propulsion Systems, and other specialty products.